How Black Students Helped Lead the 1968 Columbia U. Strike Against Militarism & Racism 50 Years Ago | Democracy Now! former leader of the Student Afro-American Society at Columbia University. He is now a criminal defense lawyer who also practices international human rights law. student at Barnard College at the time of the 1968 student strike and a former member of Students for Democratic Society. She is now a lawyer working in community development and founder of the Women’s Housing and Economic Development Corporation in the Bronx. chair of the Columbia University chapter of Students for a Democratic Society during the student strike of 1968. He was elected national secretary in 1969 and was the last to hold the position. editor of the book A Time to Stir: Columbia ’68. He has also made a 7-hour documentary about Columbia ’68. He teaches at the School of Visual Arts in New York. Fifty years ago today, on April 23, 1968, hundreds of students at Columbia University in New York started a revolt on campus. They occupied five buildings, including the president’s office in Low Library, then students barricaded themselves inside the buildings for days. They were protesting Columbia’s ties to military research and plans to build a university gymnasium in a public park in Harlem. The protests began less than three weeks after the assassination of Dr. Martin Luther King Jr. The 1968 Columbia uprising led to one of the largest mass arrests in New York City history—more than 700 people arrested on April 30. It also inspired student protests across the country. Today, we spend the hour looking back at this pivotal moment. We are joined by Raymond Brown, former leader of the Student Afro-American Society; Nancy Biberman, a Barnard College student who joined the protests as a member of Students for Democratic Society; Mark Rudd, chair of the Columbia University chapter of SDS during the student strike; Juan González, Democracy Now! co-host who was a Columbia student and strike organizer; and Paul Cronin, editor of the new book “A Time to Stir: Columbia ’68.” We also feature excerpts from the 1968 documentary “Columbia Revolt” by Third World Newsreel. JUAN GONZÁLEZ: Fifty years ago today, on April 23rd, 1968, hundreds of students at Columbia University in New York revolted—started a revolt on campus. Students went on strike. They occupied five buildings, including the president’s office in Low Library. They barricaded themselves inside the buildings for days. They were protesting Columbia’s ties to military research and plans to build a new gymnasium in a public park in Harlem. The protests began less than three weeks after the assassination of Dr. Martin Luther King Jr. The 1968 Columbia uprising led to one of the largest mass arrests in New York City history, as more than 700 people were arrested on April 30th. It also inspired student protests across the country. Today we spend the hour looking back at this pivotal moment. Several of the student organizers are joining us in a minute. As one of them writes today in an op-ed in The New York Times, quote, “In popular memory, the Columbia protests were a high point of the campus movement against the Vietnam War, and a mile marker in its radicalization. But this history, which privileges the actions and concerns of white students like myself, is incomplete, and it misrepresents what made the protests so powerful—the leadership of the black students.” Those are the words of Mark Rudd, who will join us in a minute. We’ll also speak with Raymond Brown, former leader of the Student Afro-American Society, and with Nancy Biberman, who, like Rudd, was a member of Students for a Democratic Society, or SDS. But first we begin with excerpts from the documentary Columbia Revolt by Third World Newsreel. STUDENT ORGANIZER 1: We now demand—we no longer ask—a say in decisions that affect our lives. We call on all students, faculty, staff and workers of the university to support our strike. We ask that all students and faculty not meet or have classes inside buildings. We have taken the power away from an irresponsible and illegitimate administration. We have taken power away from a board of self-perpetuating businessmen who call themselves trustees of this university. We’re demanding an end to the construction of the gymnasium, a gymnasium being built against the will of the people of the community of Harlem, a decision that was made unilaterally by powers of the university without consultation of people whose lives it affects. We are no longer asking, but demanding, an end to all affiliation and ties with the Institute for Defense Analysis, a Department Department venture that collaborates the university into studies of kill and overkill that has resulted in the slaughter and maiming of thousands of Vietnamese and Americans. STUDENT ORGANIZER 6: Defense is all taken care of. Security is a problem, letting people in and out of the buildings. Watches—we need people to watch the windows every night. Nancy Biberman is with us. She’s here in New York. She was a student at Barnard College at the time of the '68 strike, a member of SDS, Students for a Democratic Society, now a lawyer working in community development and founder of the Women's Housing and Economic Development Corporation in the Bronx. Now, you were all—Raymond, Juan, Nancy, Mark—you were all there on April 23rd, 50 years ago today. Juan, why don’t you kick this off? Describe what happened that morning. JUAN GONZÁLEZ: Well, there was a major rally called by the Students for a Democratic Society, as well as the members of the Student Afro-American Society, who joined the protest, as well, basically continuing the ongoing protest against the university’s involvement in research for the Institute for Defense Analysis, a group that was doing a lot of research for the Pentagon for the Vietnam War, and against the construction of the gymnasium that Columbia was trying to build in Morningside Park. And a variety of forces came together—the SDS students, the SAS students, a lot of other folks who were involved in the community struggles around the gym. And everyone gathered at the Sundial and, initially, marched to the gym site and then came back on campus. And we all ended up in Hamilton Hall, which was the main undergraduate classroom building for the Columbia College students. And that’s when the sit-in began. But certainly, the black students played a pivotal role, because, first of all, we were more disciplined than any other group. We determined—we were the first to determine to barricade buildings. We asked, in a manner that’s become controversial in the ensuing years, the white students to leave and grab other buildings. And we barricaded that first building. NANCY BIBERMAN: So, at noon, we all gathered at the Sundial in the middle of the college campus, and there was a rally. And the rally was about, you know, the ongoing anger at the war in Vietnam and, in particular, our university’s affiliation with research for the war. And we were also very much aware, as Ray said, Dr. King had just died. You know, we were—had been assassinated. You know, we were all in the streets, and I think everyone was in high-tension mode. And, you know, what we were able to focus on—I mean, symbols are as important as facts sometimes, and in this case, especially, the gym was the most powerful symbol of racism that we could see in our neighborhood. It was right there. It was on a bluff, the proposed gym between the university and Harlem. It was a public park. And it was, you know, designed for students, with a backdoor entrance to the community. It was offensive, and we were all rallying behind that. MARK RUDD: Right. There’s a lot to be said, of course, about the Columbia strike, but that point that the leadership of the black students has got to be made. It’s relevant today because too often the narrative of contemporary struggles focuses on the white kids. Well, it’s going to be—this particular movement that we have now, or movements, are being led by women and also by nonwhite people. So, this is a good time to look back and see what relevant history there is. H. RAP BROWN: The black students of Columbia University, joined by a few members of the black community, have been in Hamilton Hall for 56 hours—more than that now. We have established a cafeteria with adequate stores, all continuously. A physician is in charge of our infirmary. Morale is high. JUAN GONZÁLEZ: I’d like to bring Paul into this discussion. You’ve been—you’ve spent the last, what, 10 years of your life working on a project, both a book on the Columbia strike and this 7-hour marathon film that you’ve developed, and yet you’re a British national, right, originally? PAUL CRONIN: No, actually, I’m American, too. My mother is—my mother is American. PAUL CRONIN: Well, the bottom line is, it’s just a fascinating story. And it’s not as if anyone had revisited it in any detail since 1968. Some Ph.D. student had not come along and pulled all the material together. I was—I knew there are plenty of people around from '68 who would be able to talk. The fact is, Columbia University was full of very smart people, very articulate people. And I've met some extraordinarily articulate people over the years. Also, the massive raw primary material that’s come to light—I have generated an archive of 30,000 photographs, most of which have never been seen before, thousands of pages of documents. So, it’s just been a fascinating story to tell. It’s a very dramatic story. I mean, the interplay between the black students and the white students, between the faculty and the students. I mean, any number of dynamics at play here make it a very interesting and dramatic story. PAUL CRONIN: —Morningside Heights, and, say, the TPF, the Tactical Patrol Force, which was this elite group of cops who were in existence, I think, from ’59 to 1984. And by ’68, they were sort of at the peak of their powers. They were sort of parachuted in to hotspots around the city. So, the beat cops were not terribly happy to have these guys on their turf. So, any number of these interactions creates interesting stories and interesting drama. FORMER COLUMBIA STUDENT 1: It was a deeply symbolic moment, because on this side of the fence is legality, politeness—I am part of the establishment, expressing my opinion—and on the other side of this very humble chicken-wire fence is trespass, the realization that we are called upon to do more than simply express our opinions. PAUL CRONIN: And what my film tries to do, and I think—I mean, Mark is very good on this. I know Mark can speak to this. But the film is seven hours, in part, because April 23rd, 1968, 50 years to this day, doesn’t come in until two hours in. I mean, there’s a whole back story to 1968. And I’ve been reading, in the last two or three days, the very brief newspaper summaries of events. And they—I mean, to say they barely scratch the surface is self-evident. There’s an extraordinarily interesting story—in a way, even more interesting than what happened in '68—the story of the founding of SDS on the Columbia campus, the founding of SAS, Student Afro-American Society, on campus, the growing organizing, the antiwar activism that's going on. It brings together extraordinarily interesting people. RAYMOND BROWN: —that young people especially don’t understand. 1964 is 10 years after Brown v. Board of Education, nine years after Emmett Till, nine years after Bandung. We were very conscious of the fact that the university was kind of saying, “Well, maybe if white supremacy isn’t the thing anymore, we’ve got to have some brown students here.” Their mistake was in assuming that brown students were white students with brown skin, and not engaging with us on the issues that we brought to this reality. But this is, really, shortly after the government, through the courts, have said, “Well, white supremacy isn’t hip anymore, because we’ve got to persuade the rest of the people in the brown world that we’re really better than the communists.” So, that’s the context in which this all took place. RAYMOND BROWN: My class, which came in in ’64, the class of ’68, had 20 students—biggest class they had ever had in the college. JUAN GONZÁLEZ: I was class of '68. And there weren't even enough Latinos to have an organization back then. JUAN GONZÁLEZ: Now we want to go into the dorms with all of you, with some of you who may not—who may not agree with a lot of what we’ve been saying here, who have questions, who support us, who want to know more. Let’s go to the dorms. Let’s talk quietly, in small groups. We’ll be there, and everyone in Livingston—in Livingston lobby, in Furnald lobby, in Carman lobby. We’ll be there, and we’ll talk about the issues involved, and we’ll talk about where this country is going and where this university is going and what it’s doing in the society and what we would like you to do and what we would—and how we would like to exchange with you our ideas over it. Come join us now. But I just wanted to say that the story of any action, any protest, usually goes way back. And in this particular case, it has to do with, in part, years of organizing that SDS engaged in. When I got there in September of '65, what became SDS, the students who became, who formed SDS, had already been organizing against the university's racism, in the form of the university refusing to allow black and Latino cafeteria workers to form a union—it was clear racism—and also the university’s involvement in the war, which had just began, in April and—well, with main force troops. The university was training naval officers. MARK RUDD: The great civil rights organizer and leader, Ella Jo Baker, has often talked about—often talked about doing the spadework. Well, we did that spadework. So, that’s a story, I think, is worth telling, because it’s got to be done now. That organizing, strategic organizing, is the issue. JUAN GONZÁLEZ: Well, 50 years ago today, hundreds of students at Columbia University in New York started a revolt on campus. They occupied five buildings, including the president’s office in Low Library. The students barricaded themselves inside the buildings for a week. They were protesting Columbia’s ties to military research and plans to build a university gymnasium in a public park in Harlem. The protests began less than three weeks after the assassination of Dr. Martin Luther King Jr. The 1968 Columbia uprising led to one of the largest mass arrests in New York City history. A week into the strike, on April 30th, New York City police stormed the campus, with hundreds of students who were injured, and 700—more than 700 were arrested. Images of the police assault were broadcast across the country. This is another clip from Columbia Revolt by Third World Newsreel. STUDENT STRIKER 3: I was arrested. They would not allow me to see a doctor. I had broken ribs. My face was cut. I got hit with a pistol under the eye and was bleeding there. And I wasn’t allowed to see a doctor 'til I got out of court, which was approximately 10 hours later. But I was awarded a fellowship for next year. What the hell does—I'm sorry. What does it mean? I’m going to strike. I hope every—I don’t see how any teacher, I don’t see how any student can attend this school anymore. And I was completely liberal about the whole thing. But this bust has radicalized everybody, and me very personally. RAYMOND BROWN: Just to the black—they consciously tried to split us off from the rest of the students. RAYMOND BROWN: The university, the police—we had visitors from the mayor’s office, from the president’s office. Everybody was trying to separate us, because we were the fulcrum. And it turned out, they couldn’t lure us out with those promises. We knew there were going to be arrests. We took a lot of precautions. None of our people were injured at all, because we were very disciplined about it. We had studied counterinsurgency doctrine. We had met with police officials over the years to talk about how they handle demonstrations. We had thought about this, because the experience of black folks and police and civil disobedience is different from others. So we were quite prepared for this. None of our people were injured. That doesn’t mean we endorsed the use of force against the white students. JUAN GONZÁLEZ: And, of course, Mark, you might want to talk about this, in terms of the students that were occupying the other buildings, both SDS and non-SDS, were obviously a much more amorphous group, various different political tendencies. There was a much more sort of participatory democracy approach to making—decision-making, which made it very difficult to actually reach decisions and consensus on particular actions or tactics. MARK RUDD: All true. But it didn’t matter to the cops. They didn’t care whom they attacked, as long as—we were all fair game. In fact, I recall that they even attacked the jocks, who were supporting the cops. They were cheering the cops on, and the cops beat them up. No, they wanted—they had a lot of hatred, possibly misplaced patriotism, possibly class hatred against us. At the 40th reunion 10 years ago, one of the city officials described the cops as having sat in their buses for days gnawing on their night sticks. Well, they took it out on everybody. And it didn’t matter what political tendency you were or even if you supported them. NANCY BIBERMAN: So, the arrests, what I—the arrests itself, I would say, we did expect it. You know, people were barricading themselves in the buildings, you know, come what may. And “come what may” really meant that we expected that the police would come in. What I found the most shocking about the arrests was the police activity all over campus. I saw the university rabbi, who was standing in the middle of campus, being beaten up, bloody. And there were so many bystanders that night, people who had nothing to do with this. People who were running back into their dorms, you know, were just wantonly beaten up. So, people called it then a police riot. And I think it was. RAYMOND BROWN: —important to see the class issue. When I was—I remember the cop who was booking me, was a white cop. And he said, “I sort of understand why you colored kids would be raising heck over there at the university, but I don’t understand these white kids, who have such privileges.” And I didn’t engage in a dialogue with him, because I was doing “name, rank and serial number.” But it’s interesting that there were a lack of discipline and a lack of focus. And remember, I think once they had removed the black students, which they thought was a potential powder keg, it was open season. 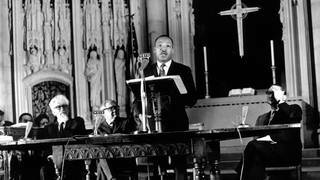 AMY GOODMAN: The Columbia Daily Spectator reported—this is two weeks before, April 10th, 1968—”Walkout Disrupts Memorial to King.” It said Mark Rudd commandeered the microphone from the chaplain and declared the university was, quote, “committing a moral outrage against Dr. King’s memory. We will therefore protest this obscenity.” It said Mark Rudd then walked down from the pulpit and was followed out of the church by dozens of people who were part of the memorial. The chaplain, John Cannon, refused to condemn the action, saying, quote, “Any student who is moved by the spirit of the truth … is able to speak in this chapel any time.” Do you remember this, Ray Brown? RAYMOND BROWN: I remember it. I wasn’t present. Remember, there was a very strange relationship between SAS and SDS. We had a wide variety of attitudes and ideological perspectives within the organization. And so, we were—some of us perhaps affiliated more freely and watched SDS more closely, but that was a different path. MARK RUDD: It’s hard to forget. I remember being terrified and shaking as I held the microphone. You know, everyone was shaken to the core. Everyone in the whole country was shaken of the core by the murder of Martin Luther King. And the night that—after he was murdered, Harlem went up in flames. I was there. I went down into Harlem from looking out over the Morningside Heights, Morningside Park, looking down. I said, “How can—we got to go.” I went down and checked it out. Wow! The anger, it gripped all of us. So, the university had been, for years, denying a union. Martin Luther King had been—he died helping the sanitation workers in Memphis unionize. What kind of hypocrisy was this? So, it was kind of like it had to be done. AMY GOODMAN: In fact, you’re all having a—you’re having a kind of teach-in this week at Colombia about what happened 50 years ago. And there is student organizing on campus, the graduate students. This is happening on campuses across the country. Harvard students just voted to unionize. Your event is happening Friday night. Also, I understand, there’s an occupation going on right now around students deeply concerned about Columbia suicides and not feeling that there’s not enough mental health facilities there, Juan? JUAN GONZÁLEZ: Well, yeah, I think it’s almost appropriate that the potential to disrupt or to somehow create dislocation in a commemoration of a strike by another strike. So I think it’s perfect—it’s poetic justice for the university. The reality is that Columbia University, like all of these giant universities, they all attempted to reform in the aftermath of the protests of the '60s and ’70s, but, institutionally, they are still giant corporations that see the need to train the young people of society to fill the jobs that the elite of the society want, so that they regress. They constantly regress. No matter what they say, they always regress back to the same policies of elitism toward the communities around them. I can't think of the urban university in America that is not gobbling up the land of the residents right around them and attempting to build more buildings—the edifice complex of every university, that they all have to build the newest building. So, it’s a continuing problem in America, the role of the universities vis-à-vis their communities. RAYMOND BROWN: Yeah, tonight I’m going to be at a black student event in Hamilton Hall. But it’s interesting that the Times ran an in-depth story the other day, and Bollinger, the president, made a kind of wan—W-A-N, not J-U-A-N—comment about, “Well, we didn’t like the way they went about it,” as though civil disobedience was invented at Columbia in 1968. And it’s astounding that the university isn’t really engaging. It sells itself as a place for student engagement, and yet they’ve ignored '68, in most respects, and don't really seem to have had a pedagogical experience in ’68 and have learned institutionally how to relate especially to impoverished communities around them, including communities of color. AMY GOODMAN: Nancy Biberman, also speaking, an organizer today, was at Barnard College with SDS. Mark Rudd, chairman of the Columbia chapter of SDS. And Paul Cronin, A Time to Stir: Columbia ’68, he’s edited the book, worked on this issue for 50 years—rather, for 10 years. The event took place 50 years ago.